Air Niugini’s Rural Sales Agent (RSA) office in Kudjip, Jiwaka Province was officially opened last Thursday, paving the way for people from within the community as well as South Waghi, Anglimp and those traveling in from Simbu through the highlands highway to have access to Air Niugini services and products. 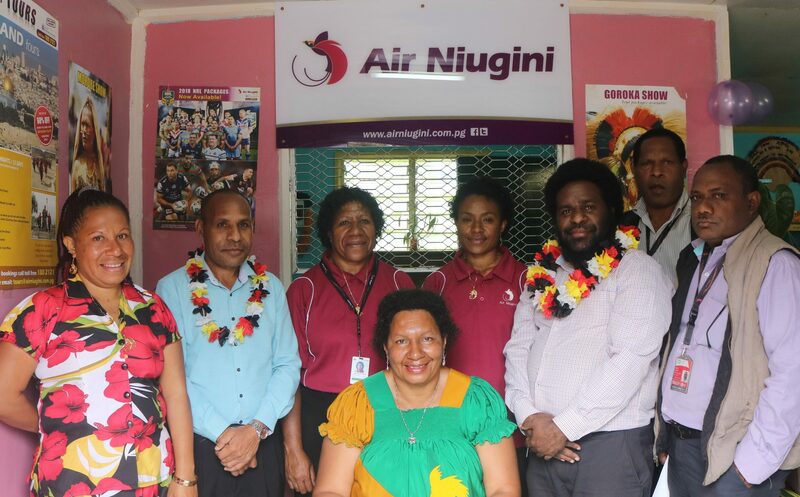 Located at Kingku Travel and stationary building at Kudjip junction, the RSA office represents Air Niugini by providing its services including the sales of airline tickets to customers in Kudjip and other underserviced, rural communities who do not have direct access to ANG services. RSA Team Leader in Kudjip, Gertrude Andrias thanked Air Niugini for the trust and confidence the airline has in her team by appointing them to represent ANG in Kudjip. She further urged the people to make good use of the airline services being provided right in their community. “We do not have to travel long distances and at greater risks to get into Mt Hagen to buy ANG tickets, it is now a thing of the past as these services are now provided right at our door step. “ I urge the people of Kudjip, our tribesmen and women from Kuma and Seking and the neighboring communities to appreciate the services being provided by Air Niugini. These services are now accessible within our community, lets make good use of them and at the same time respect and look after the facilities that allow the provision of these services.” Mrs Andrias said. Air Niugini’s Project Manager for Sales, Mr Peter Dokta said of the total four RSAs appointed so far to pilot the project, two are located in Jiwaka including Kudjip and Banz. The other two are in Maprik, East Sepik and Kainantu in Eastern Highlands Province with atleast additional six RSAs to be appointed soon throughout the country. He further explained that the RSA initiative is part of ANG’s commitment to service the rural population as the airline understands the challenges people face moving to and from rural areas into towns and cities to access airline services. The four rural sales agents have commenced operations on 18th June, 2018. Air Niugini encourages people in Kudjip, Banz, Kainantu and Maprik to fully utilize these services by visiting the RSAs for their travel needs.